Our exploration of the geography of Steven Erikson and Ian Esslemont’s Malazan world continues. Lether is the second-largest of the world’s known continents. Relatively remote, it is located far across the enormous Domain Ocean to the east of Assail and to the west of Jacuruku across the White Spires Ocean. The eastern-most part of the Letherii continent, known as Kolanse, is located to the south of the remote western-most shores of Seven Cities, but vast ice floes and unfavourable currents inhibit trade between Lether and the rest of the world. Vast wastelands and deserts divide the inhabited eastern-most and west-most parts of the continent from one another. Enormous ice floes cover the far north-west of the continent, despite the equatorial location, the result of clashes between the Jaghut and their enemies in ancient epochs. Politically, the continent is dominated by an enormous, expansionist empire which believes in power through the enrichment of the mercantile classes, which in turn funds an exceptionally well-trained army. This Kingdom or Empire of Lether is surrounded by vassals (such as Bluerose and Drene) or submissive client-states which are happy to exploit the kingdom’s vast markets for their own gain. However, the kingdom’s expansion as come at the cost of various nomadic tribes, and the surviving such tribes (the most powerful of which are the Awl to the east and the Tiste Edur to the north) maintain their independence through resistance to Letherii hegemony. A map of the continent of Lether. Some details are speculative. Please click for a larger version. Lether, like most of the known world, was settled by humanity during the days of the First Empire. The colonisation of Lether was thorough and impressive. When the First Empire collapsed, the Letherii colonies were cut off and entered a dark age, but through it all maintained memories of the days of empire. The powerful, if unrefined, magic of the First Empire survived through the Holds (whilst the rest of the world embraced the warrens). For thousands of years the descendants of the First Empire ruled a collection of city-states and small kingdoms, whilst other tribal groupings maintained their independence. Several centuries ago, the city of Letheras assumed primacy over the other city-states of western Lether. It quickly established itself at the centre of a powerful kingdom which conquered, annexed or peacefully absorbed dozens of other cities until it covered much of the western half of the continent. Its primary weapon was not the sword or the bow or sorcery, but coin. Letheras seduced all who came into contact with it with the promise of access to its rich markets, its formidable merchant fleet and its well-guarded trade caravans. Yet those nations and cities which entered in such trade pacts did not find themselves enriched, but instead subsumed. Their own resources were exploited for the benefit of Letheras and they quickly found themselves indebted and subservient. In such a manner, the Kingdom of Lether (sometimes referred to as the Empire of Lether, although the ruler only styles himself “King” rather than “Emperor”, despite the vast size of his dominions) stretched from the Domain Ocean inland almost to the borders of the Wastelands, and from the immense glaciers of the north to the Dracons Sea and the southern oceans beyond. The current Diskanar Dynasty is believed to be even hungrier for expansion, eyeing both the primitive tribes to the east and south-east and the Tiste Edur tribes to the north. Fifty years ago, communications with the far eastern kingdom of Kolanse were abruptly curtailed. Although trade with the cities of the Pelasiar Sea and other eastern regions has continued, the reasons for Kolanse going silent have never been made clear, and the vast distance between Lether and Kolanse has prohibited any investigation of the situation. Lether is a very large continent located in the southern hemisphere. It stretches from the southern equatorial band deep into southern waters, and is mostly temperate. Immense icefields and glaciers, created by the Jaghut through the use of Omtose Phellack sorcery, cover the north-western end of the continent, close to the Tiste Edur lands, and these glaciers help cool the northern parts of the continent. These glaciers also contribute to the continent’s isolation, preventing any port from being built on the continent’s northern coast which would allow for easy trade with the (relatively) nearby powers of Cabal and Perish to the far north or Jacuruku, Quon Tali and Korelri to the east. In the heart of the continent is a desolate region consisting of badlands, an impassable desert and more wastelands which blocks almost all overland travel between the western end of the continent, dominated by the Kingdom of Lether, and the eastern, dominated by the Kingdom of Kolanse. The Tiste Edur live in a coastal region of the continent, trapped between the cold Calash Sea (part of the Domain Ocean) to the north and west, mountains to the south and the immense Jaghut-created ice fields to the east. Their lands are harsh and poor. There are six Tiste Edur tribes: the Den-Ratha, Merude, Sollanta, Beneda, Arapay and Hiroth. The Hiroth are the largest and powerful tribe, controlling the passes leading south into the Kingdom of Lether. Recently, the Hiroth chieftain, Hannan Mosag, has declared himself Warlock King of the Edur and forced the other tribes to swear fealty to him following a war of unification. The Tiste Edur’s long-term intentions are unknown, but the Letherii do not consider them a viable threat. The Kingdom or Empire of Lether dominates the western half of the Letherii continent. The heartlands of the kingdom lie along the Lether River, particularly its capital, Letheras. Major cities and towns of the kingdom of Lether in this western region include Old Katter, Dresh, Awl, Tulamesh, Rennis, Bridle and Harness. To the south, along the Ouster Sea, Domain Ocean and Dracons Sea, lie formerly independent city-states long subsumed by Lether. These include Old Gedure, Roster, Sadon, Lenth, Gedry (sometimes now called Lether Mouth) and Deselen. To the south-east lies Truce, a Letherii city which has become the heart of semi-autonomous state around it, incorporating cities such as Gress, Obertull, Rance, Mawkesh and Fein. Further south is the protectorate of Karn. South of the Dracons Sea lies a number of Letherii protectorates and client-states, including Dracons (which spans the north and south shores of the sea and the intervening Pockface Islands), Korshenn, Descent, T’roos, Pilott, Isthmus, D’aliban and Deal. Letheras is the capital of the Kingdom of Lether and one of the largest cities on the continent. It is located on both sides of the River Lether at the meeting point of several prosperous trade routes. The city is covered by canals, docks, mercantile directs and noble estates. The origins of Letheras are ambiguous. The city was certainly once a colony of the First Empire, but it was settled a long time earlier than that by the Jaghut. There is also an Azath Tower in the city, which is scrupulously avoided by most residents and visitors. Bluerose is the name given to the formerly independent kingdom located along the shores of the Bluerose Sea. Three major cities are in this region, namely Bluerose, Jasp and Outbound. Bluerose was annexed by the Letherii nation some years ago and the people of Bluerose are now loyal servants of the empire, their soldiers forming the backbone of Lether’s formidable cavalry formations. The origins of Bluerose are unclear, its inhabitants apparently being superstitious, following a deity or folklore figure known as the Black-Winged Lord. Rumour also speaks of a hidden stronghold in the mountains, Andara, but this appears to be a local legend. Old Bluerose, sometimes called “Andii Bluerose”, lies along the west coast of the Bluerose Sea. However, Lether has also colonised the lands to the south, curving around the shores of the Bluerose Sea and extending to the east. Major cities in this region include Pearls, Stall, Wend, Olived, Santchur and Korasch, with Ouster guarding the passes south. The most recent major Letherii acquisition is the kingdom and protectorate of Drene in the east, whose impressively fertile soil helps feed the rest of Lether. Three significant tribal groupings lie along the borders of the Letherii Empire. The D’rhasilhani are located to the east of Deal and the Sea of Dracons and are noted horse-breeders and traders. The Akrynnai are more formidable. Hailing from their tribal homeland of Ak’ryn, east of D’rhasilhani and south of eastern Bluerose, the Akyrnnai have annexed the kingdom of Kryn (whose numerous rivers provide a barrier to an invasion from Lether to the west). The Akrynnai are noted as both warriors and merchants. The Awl are more belligerent and powerful. Located in the Awl’dan, a vast grassland region north-east of the Akyrnnai, the Awl are a nomadic people who dwell in yurts. There are five Awl clans of note: the Aendinar, Ganetok, Niritha, Renfayar and Sevond. The Ganetok are the strongest clan. The Letherii annexation of Drene has given them a border with the Awl, which the Awl are not happy about and tensions have recently risen between the two powers. The kingdoms of Bolkando and Saphinand are located to the east and south of the Akrynnai and Awl tribelands. The two kingdoms are allies, separated by the Ak’ryn Corridor (a buffer zone where the Akrynnai engage in trade). Both kingdoms engage in political intrigue as a way of avoiding conquest by their rivals (most notably Lether), with the current Queen Abrastal of Bolkando particularly respected as a keen player of the political game. East of the Awl’dan and beyond the small kingdoms lies an area of badlands and hostile wilderness which spans the continent from coast to coast, north to south. This region is known as the Wastelands. It is virtually treeless, with hills, mountains and ridges jumbled together. Sources of water are rare. Even the hardy nomads of the Awl’dan find surviving in the region difficult, and generally shun it. The Glass Desert is a dead region located in the centre of the Letherii continent, east of the Wastelands and west of Kolanse. The desert is notable for the complete and total absence of water and life: the desert has been scoured down to the bedrock and is utterly dead, beyond the harshness of any other desert or wasteland in the world. The Glass Desert is believed to be uncrossable, with overland travel diverted south to a narrow, more survivable corridor along the coast. However, a lot of travel between the two ends of the continent are undertaken by sea. According to rumour, a once-great and glorious city can be found in the very heart of the Glass Desert, Icarias, but this is considered fanciful by many. Kolanse is the name given to both the eastern-most region of the Letherii continent and also the kingdom which dominates the region. Kolanse appears to be analogous to Lether, a powerful mercantile kingdom which has come to dominate the entire region, although this region is much more sparsely populated than the west. Kolanse City itself is a large port, located on Kolanse Bay, an inlet of the White Spires Ocean. Located at the mouth of the Valley of Blessed Gift, Kolanse City is one of the largest cities east of the Glass Desert, if not the largest. To the north, beyond the mountains, lies Estobanse Province, an enormous and fertile region fed by generous rivers. Towns and cities such as Back, Danan, Hetok and Trelar lie in this area. Estobanse keeps the rest of the kingdom fed during times of famine. South of Kolanse City the kingdom extends along the coast of the White Spires Ocean. Numerous seaports dot the coast, with fast-running rivers running down from the mountains to the sea. At the southern end of this region is an immense gulf, the Pelasiar Sea, in which lies the Isles of Otpelas. 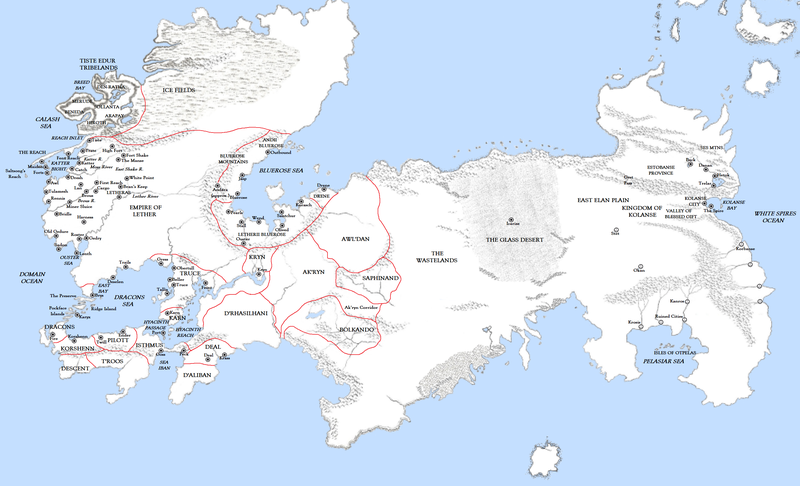 Nearby cities such as Krosis, Kanros and, further inland, Okan and Stet (formerly a forest city whose forest has dwindled), are vassals of Kolanse. West of Kolanse and east of the Glass Desert lies the Elan Plain, the home of the nomadic tribespeople of the same name. The Elan are divided into bickering and feuding tribes. Fifty years ago most communication between Kolanse City and the rest of the continent was abruptly cut off. The reasons for this remain unclear. Trade with the rest of the region has continued, but in recent years there have been reports of devastating famines and other calamities affecting the eastern end of the continent. Credits: Based on the original maps created by Neil Gower. Extrapolated by D’rek at the Malazanempire forum. Placements and names adjusted by myself. Based on the Malazan Book of the Fallen series, Kharkanas Trilogy and Witness Trilogy by Steven Erikson, and the Malazan Empire and Path to Ascendancy series by Ian C. Esslemont.